Low Carb Mini Cheesecake Bites | Fourth Of July! With Fourth Of July right around the corner we have the perfect dessert for you, Low Carb Mini Cheesecake Bites. You can stop worrying about what you'll bring to the party and start getting ready to make this simple dessert recipe that will impress your friends! The dense chocolate crust is the perfect complement to the rich and creamy, colorful cheesecake topping. Watch me make it below! You can of course leave out the coloring if you don't have any, but then they won't be festive! Although the Fourth Of July is already highly celebrated with drinks, fireworks and delicious grilling foods, another little reminder in the form of heavenly cheesecake bites won't hurt. To be frank, I only want to be eating red, white and blue foods on the Fourth Of July anyway. The chocolate crust is my favorite part. It was actually Matt's idea and at first I thought it would make the cheesecake bites look terrible. Brown is my favorite color, but it's not really a festive color and does in fact clash with red and blue. However, it tastes incredible! The rich cream cheese and sour cream blend of the filling a top a decadent, moist, chocolate crust is a match made in heaven. I kid you not! I honestly wouldn't even go the route of a non chocolate crust. Trust me on this one, your friends and family will love it. We have a bit of an obsession with cheesecake in bite size form, hence why we have three other cheesecake recipes! If you're looking for a mo re no bake style you should definitely make our Cashew Cheesecake or Chocolate Cheesecake. If for some reason you think a pumpkin recipe is appropriate to bring to a Fourth Of July event, you should give our Pumpkin Cheesecake Cupcakes a try! Now that I've sold you on all my other cheesecakes, I should say that these Fourth Of July mini cheesecake bites aren't going to be the way you want to go this year! 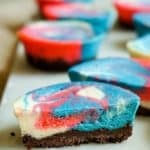 Recipe can be quickly added to MyFitnessPal - Search "KetoConnect - Fourth Of July Mini Cheesecake"
Low Carb Mini Cheesecake | Fourth Of July! In a bowl combine the coconut flour, coco powder and erythritol. Cut up 3 tbsp of cold butter into little chunks and add to the dry ingredient bowl. Using your hands combine everything creating a sand like texture. Press the chocolate mixture into the bottom of a greased muffin tin to create the crust (should make 11-12). Bake in a 350 degree Fahrenheit oven for 12 minutes. Using a hand mixture combine cream cheese and erythritol. Add the sour cream, egg, vanilla extract and heavy whipping cream and combine well. Split the filling into three even bowls. Set one aside for the white portion. Add 25 drops of blue to one bowl and 25 drops of red to another bowl. Using a spoon combine the drops into the filling completely. Fill three ziplock bags with the three colored fillings. Push the filling to one corner of the bag and cut the tip about a 1/4 of an inch. Squeeze out the filings onto the cooled crusts as evenly as possible in their own section (you'll have 3 equal color sections like a piece sign). Using a toothpick swirl the colors around. Bake at 300 for 50 minutes. When complete check with a toothpick. If it comes out clean it is done. Let it cool for 15-20 minutes before placing in the fridge to set. The cheesecakes will deflate slightly. Store in fridge up to 10 days or freeze up to 2 months!